Here is the email Google sends their employees on their work anniversary. This one is specific to the first year anniversary and it was shared by Danny Sullivan who started October 9, 2017. Pretty fun! He shared the photo on Twitter and said "I believe as it's my one year anniversary at Google that I get everything announced by @madebygoogle today. 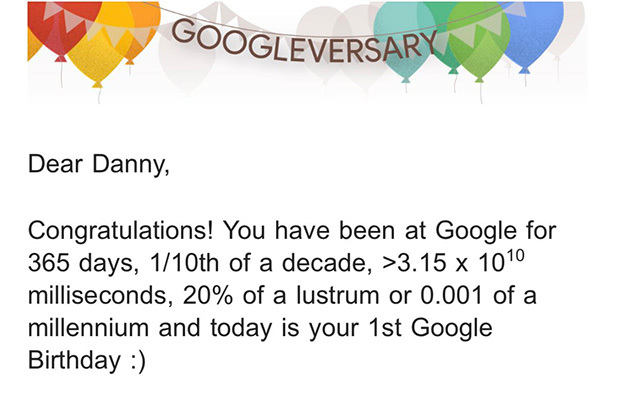 Well, I may settle for my "It's your Googleversary" email." We have seen 10 year work certificates, ten year shirts and five year shirts. I've never seen the email.